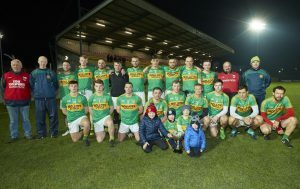 AN excellent second-half performance from Rathvilly on Thursday saw them end their year with senior football league Division 1 silverware in their possession on Thursday in Netwatch Cullen Park. There won’t be too much celebrating in the Wicklow-border village but any time serious rivals are turned over, and in such emphatic fashion, is a satisfactory evening’s work. The eventual winners even had to get over the shock of conceding an early goal but ultimately they always looked the most likely and were easy winners in the end. Between them the Murphy brothers, Brendan and Brian, contributed 12 points with the former producing a piece of magic in the second half when controlling a ball with his foot which was threatening to get away from him. He still had it all to do but he shrugged off a tackle and floated the ball over the bar from almost 40 metres out. Brian scored four points on the trot in the third quarter but he would be the first to admit the service he received from those around him was perfect. When Rathvilly are in the mood you cannot play like Palatine did. The Bennekerry side were way off the mark, didn’t know how to break down a wary defence and failed to get back in numbers when they were turned over. An third minute point from Gary Owens sent Rathvilly on their way. 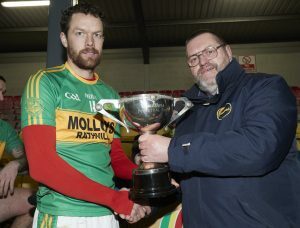 They were rocked when a Palatine attack seemed to be petering out but with an advantage coming, Conor Reynolds flicked the ball past the advancing Robbie Molloy in the Rathvilly goal. Far from lifting Palatine, it was their rivals who reacted best. Under pressure, Brendan Murphy knocked over a fine point. There were some half-hearted Palatine attempts to get inside the big man’s head as they did in the county final but this time no-one was reacting. In the end Murphy did as he pleased, drew a yellow card for Cian Forkan in the third quarter and bossed midfield for most of the second half. At the break Rathvilly led 0-7 to 1-2 and were good value for their advantage. A typical David Reid point within 42 seconds should have had the potential to wake Palatine. 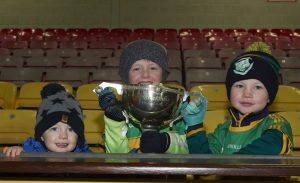 Instead many of the young Rathvilly players took on the responsibility with the more experienced Murphy brothers turning the screw. This sort of result will bring the likes of Conor Doyle, Conor O’Brien, Josh Moore, Gary Owens and Jake Elliot on a ton. Rathvilly mentors were furious in the second half when Doyle was felled off the ball but after consulting with his linesmen and umpires, referee Patrick Murphy didn’t see fit to take any action. Apart from those few incidents there was little physical stuff. Certainly, a league final without the extra cut and trust of championship fare. Dillon O’Toole’s goal came right at the end and while he needed two attempts to force the ball over the line, it was a landmark moment for a young and up-and-coming talent down Rathvilly way. Rathvilly: Robbie Molloy; Senan Molloy, Conor O’Brien (0-1), Jeffrey O’Donoghue; Barry John Molloy, Josh Moore, Colin Byrne; Brendan Murphy (0-3), Conor Doyle; Alan Kelly, Brian Murphy (0-9, 0-2 frees), JJ Smith (0-1); Gary Owens (0-2), Brian Smith, Danny Molloy. Subs: Gary Dempsey for B Smith (h/t), Jake Elliot for Owens (47 mins), B Smith for D Molloy (53 mins), Dillon O’Toole (1-0) for JJ Smith (57 mins). Palatine: Craig Kearney; Sean Dermody, Conor O’Doherty, Chris Parle; Stephen Reilly, Mark Rennick, Jack Brennan; Aidan Murphy, David Reid (0-1); Conor Crowley (0-3, 0-1 free), Jason Kane; Conor Reynolds (1-0), Jamie Kenny, Shane O’Neill (0-2, 0-1 free). Subs: Cian Forkan for Parle (h/t), Tomás Kenny for Kenny (h/t), Daragh Moran for Kane (44 mins), Darren Reid for Reilly (48 mins), Cormac Duff for N. Reid (58 mins).